The Riverside County Sheriff’s Department has lifted the evacuation order for Lakeland Village as of 10:00 p.m. Monday, according to a Sheriff’s official. The fire no longer appears to be a threat to the community, which Spokeswoman Vickie Wright said is composed of 5-10 acre ranches. Decker Canyon and Rancho Capistrano still appear to be under evacuation notices. Check back with IE Grapevine as we learn more about this situation. Update at 10:32 p.m.: Firefighters are still battling the blaze, which remains close to 1500 acres in size and has now caused structural damage and injured two firefighters, according to a Forestry Department representative. All resources remain in the area, including 400-500 firefighters on the ground, according to Spokeswoman Vickie Wright. Wright said that since it is night time, fire officials believe the fire will subside to some extent. Wright said the fire has burned through one “out-building” and that one other building was considered threatened, but could not confirm any other structural damage at this time. Two Forestry Service firefighters sustained heat-related injuries and were quickly transported to the hospital, according to Wright. Wright said she expected the Ortega Highway to be closed down at least through tomorrow night. Wright had a special message for residents, who she said are her friends and neighbors. Update at 9:23 p.m.: The ‘Falls Fire’ that started outside Lake Elsinore in the Cleveland National Forest has grown to approximately 1500 acres and fire officials are now calling for the evacuation of three communities, according to a report by Fire Officials. Lakeland Village, Rancho Capistrano and Decker Canyon residents now face mandatory evacuation. 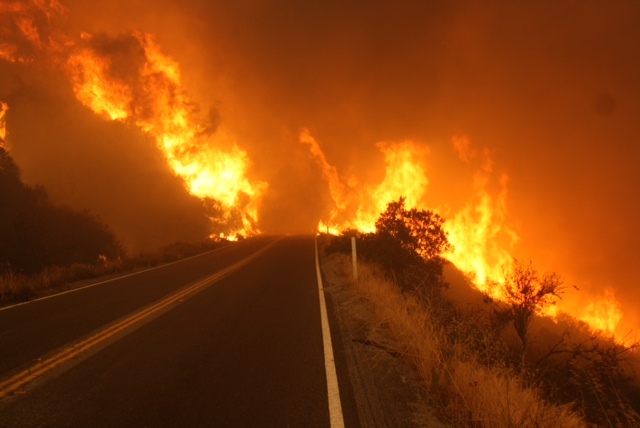 The Ortega Highway remains closed to nonresidents, according to the report. A quickly-growing 1200 acre wildland fire has prompted the evacuation of two residential areas near Lake Elsinore and required the arrival of multiple fire crews, air-tankers and engines, fire officials reported today. Additionally, the Ortega Highway has been closed between Grand Avenue and Antonio , according to Wright. 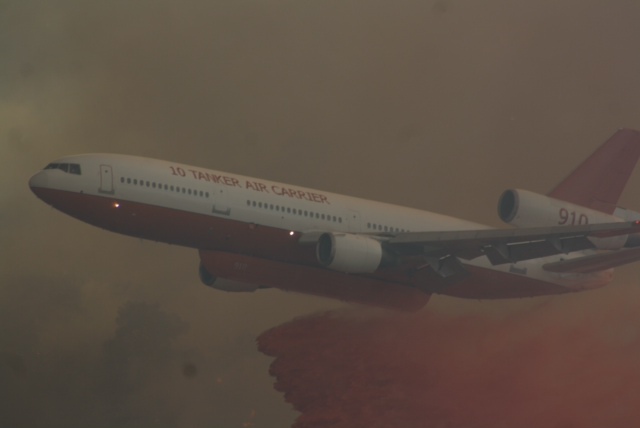 55 engines, 16 handcrews, five airtankers and one DC10 jetliner have arrived in the area to work on the quickly-growing blaze, Wright said. Check back with IE Grapevine for more details on this developing story.